Franklin Amos Coy DVM, 95, formerly of Moreland Hills, Ohio, passed away on Monday, April 23, 2018. Franklin, preceded in death by his loving wife Helen (Jenkins), son John Emerson Coy, and brother Merle (Margaret) Coy, is survived by his sister Norma Jean Bechtel, sons David Edward (Daiva) Coy, Alan Eugene Coy, Roger Gregory Coy, grandchildren Maria Lucille Coy and David Anthony Coy, and many loving nieces and nephews. Before serving in the US Navy, Franklin was a sought–after judge of horses and cattle. Following his service, Franklin practiced veterinary medicine for fifty years. He was a big-game hunter, avid fisherman, active bowler, and amateur photographer. Proud alum of The Ohio State University, he played first trumpet for The Best Damn Band In The Land, and could still play a bit of Carmen Ohio. 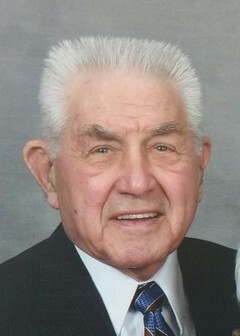 A sports enthusiast, he was a devoted fan of the Buckeyes and Cleveland Indians. He rejoiced in the Cleveland Cavaliers’ ending of The Curse. Husband, father, grandfather, uncle, and friend to many, Franklin will be sadly missed.